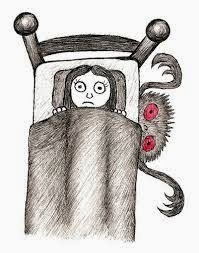 "The monster under the bed" by Stephanie Campisi is the Songs of Eretz Poem of the Day for May 2, 2014, with apologies from the editor for the late posting. A link to the poem may be found here: http://poetdeploriate.tumblr.com/post/83951895508/the-monster-under-the-bed. Another poem by the same poet is featured in the May 2014 issue of Songs of Eretz Poetry E-zine, and a brief bio of the poet may be found there. "The monster under the bed" is arranged as 16 lines of free verse. The poet's liberal use of enjambment adds to the story-like quality of the piece. The message of the poem is simple yet profound. The "monster under the bed" is quite real--it is Time, slowly leeching away one-third of our lives.